Text If there’s a tough instruction to follow in spring, it’s to relax. Don’t trim your trees, hedges or shrubs. Don’t paint the house. Greet sunshine by sitting back. The lazier you are, the more likely you are to hear the telltale cheep-cheep-cheep of baby birds, because spring is the high point of bird nesting season. Text I say “high point” because California has a long nesting season. 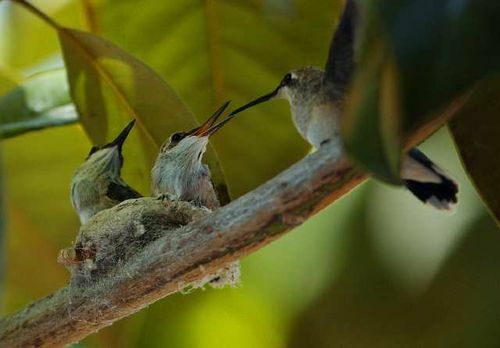 Hummingbirds have been broody since January and will remain so for some time. Think of them when you tell your gardener to leave the hedges, camellias and hibiscuses alone. Bushtits, swallows, wrens, woodpeckers, phoebes and finches are either sitting on eggs or constructing nests. Think of them, then put off termite work, gutter repair and tree thinning. The best months for tree work are August through December. Click here to keep reading “The Dry Garden” in the Los Angeles Times. I just want to say “thank you” for this post. I really didn’t know that pruning back our overgrown shrubs, bushes, trees etc (in the 71 year old home we purchased last year) could be, and probably has, disrupting birds’ nests. It breaks my heart to think that, but at least now we know to wait until after summer to finish the job!